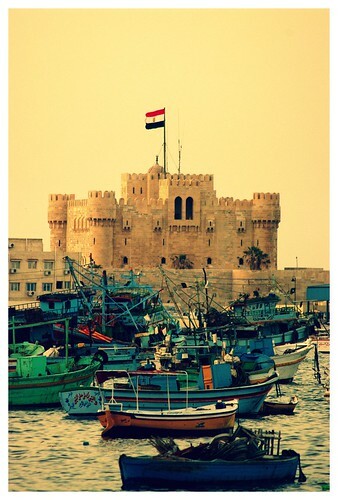 Our last days in Egypt were spent in Alexandria, the famous city founded by its namesake, Alexander the Great. We had our hotel arranged for us by a lady we met in Wadi El Naturn, (who worked at a recovery center Dave visited to do some research.) We were hoping for a cheap hotel…she booked us in a four star. Apparently it was the Coptic Easter weekend, and that’s when everyone goes and visits Alexandria (to go to the beach) so everything was booked up. Thankfully the hotel wasn’t too steep. We had a driver that was arranged to take us from Wadi to Alexandria. And somehow (I don’t think we had decided on this ourselves…) he convinced us that he was also to be our driver for the next few days, where he had already planned our itinerary in great detail. Dave, (to Morad, our driver): I think we are tired now. We’ve seen a lot already today. We would like to head back to our hotel. Morad: As you like. Or you could go to the palace. As you like. Dave: No, I think we will just go back to our hotel. Morad: Or you could go to the palace. As you like. Dave: Well, we are both just tired, and it’s late. So, the hotel would be great. Morad: As you like. You can get ice-cream and go in the palace…but as you like. Dave: Really, it’s alright. The hotel will be fine. We did end up going to the palace, but thankfully we convinced him to take us the next day. If you ever end up going to Alexandria, I highly recommend going to the library of Alexandria. In history, the library of Alexandria was one of the largest in the world. In it’s day, Alexander the great had every book that ever arrived in Alexandria copied and placed in the library. The old one was unfortunately destroyed by a fire, but in recent years they have built a library that is really quite the sight to see. It was most definitely my favorite thing I saw in Alexandria. The Catacombs: This was a burial site for many Romans who inhabited Alexandria. It’s quite vast, and very interesting. There is even a banquet room for the family of the deceased, so they could come in and feast on special occasions while in mourning. Pompeys Pillar: To be honest…I still don’t know what the significance is of the pillar. There is an ancient temple site that is below the pillar, but the pillar itself is still a bit of a mystery to me. The Citadel: This is built on the site of the famous Lighthouse of Alexandria (one of the 7 wonders of the ancient world) It is mildly interesting, but we didn’t end up going into the main building, because it is a mosque and I didn’t have a head covering with me. Not really much to see though. Just a big fortress. The Palace: This sounded a lot more interesting than it actually was. The Palace itself was only built in the early 1900’s, and you can’t even go in it. The grounds are nice, but nothing spectacular. To be honest, my favorite part of Alexandria was just the fact that it was on the Mediterranean. I enjoyed just sitting and drinking coffee, while overlooking the sea. If you ever go to Alexandria, here’s what I recommend you do: If you are wealthy beyond compare, stay at the Four Seasons. It’s amazing. Unfortunately, Dave and I are not wealthy beyond compare. But, even if you are not a guest there, you can go to their rooftop lounge that looks onto the Mediterranean, and have dinner, or coffee, or drinks…or you can just sit there (as you like :) ). The service is amazing, and it’s got a great view. Our time in Egypt is now over. Next stop, Greece. This entry was posted on Thursday, April 23rd, 2009 at 1:27 amand is filed under Culture, Egypt. You can follow any responses to this entry through the RSS 2.0 feed. You can leave a response, or trackback from your own site.